As you walk up a darkened, gently sloped ramp, the muffled sounds of Washington burning and of rockets bursting in air reverberate in the background. Brief signs, supplemented with artifacts like a charred piece of the White House, introduce the War of 1812 between the U.S. and Britain, and tell what was happening in nearby Baltimore on a September night in 1814. During that battle, Francis Scott Key looked out in the early hours, saw the 15-stripe American flag flying over Fort McHenry, and began writing the lyrics that became our national anthem. At the top of the ramp, visitors turn left, and behind a glass wall on their left is the 30-by-34-foot banner Key saw, displayed at floor level, angled up 10 degrees. The low light is a conservation measure, but also creates a beautiful dignity. "Whoa," said one teenage boy, as he caught his first glimpse. "Awesome," agreed another. With which one can only agree. 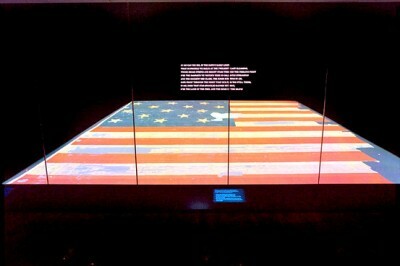 The new Star-Spangled Banner display in the just-renovated National Museum of American History of the Smithsonian Institution is magnificent: The object speaks for itself, elegantly. It sits at the core of the museum, in the place of honor. The down-ramp, where mini-exhibits tell of the Banner's making and preservation, flows into a new five-story sky-lit atrium-lobby, another welcome change to a 45-year-old museum long known for its uninspired galleries filled with artifacts of dubious historical import. Many compliments have greeted the museum's $85 million architectural revamp, which created entry lobbies from the Mall and from Constitution Avenue, installed a grand glass staircase connecting the first and second floors, and added a welcome center and other amenities. So far, so good (though to me the $2.5 million, 40-by-19-foot silvery abstract "architectural representation of a waving flag" that frames the entrance to the Star-Spangled Banner gallery is a complete bust: It doesn't wave much, fades into the background and is barely recognizable as Old Glory). But there remains the nagging question about what this, the national history museum, should be about. Is the subject political history, industrial history, scientific history, cultural history, sociological history, all of the above, or even more? A look around shows the obvious answer -- "even more." This lack of focus was criticized by a commission of experts in 2002, which also raised concerns about politically skewed interpretations and potential undue influence of private donors. The renovation, which was unveiled late last November, isn't finished. Some spaces remain closed, with the openings of shows like "On the Water: Stories From Maritime America," "Stories on Money" and "Bitter Harvest: The Bracero Program" set for later this year. Some old exhibitions, like "The American Presidency: A Glorious Burden" and "The Price of Freedom: Americans at War," remain basically untouched. Still, based on the progress to date and the announced plans, the end result will not be the real national history museum American citizens and visitors deserve. The long roster of displays -- many marked "NEW!" -- is a tad misleading or disappointing. The word was attached, for example, to a single new "landmark object" -- an 1865 telescope used by America's first female astronomer, Maria Mitchell; a two-case display of Civilian Conservation Corps archival materials; a small wall case of "sporting inventions" like a snowboard for disabled people; and a tiny Libraries space featuring "Picturing Words: The Power of Book Illustration." As for the NEW! "artifact walls" lining the lobbies, which are lightly themed (business, medicine, etc.) mishmashes of objects, they exist only to put more of the museum's extraordinarily diverse set of three million objects on display. Unlike the Star-Spangled Banner, none can -- or should -- hold its own without a narrative or better connections. The picture should be emerging. As with this museum before the two-year overhaul, the more it shows, the less it adds up to and the more muddled is the overall story it tells. What is the book show, which showcases manuscripts from Tibet and 15th-century Italy, plus works by English artists William Morris and Walter Crane, doing in the National Museum of American History? What is the "Hall of Musical Instruments," full of wonderful pieces from Cremona and Naples, Italy; Hamburg, Germany; London; and Paris, doing there? What does the visitor take away about American history from Julia Child's home kitchen or the "Thanks for the Memories" gallery, which contains Dorothy's ruby-red slippers from the Wizard of Oz, boxing gloves from Joe Lewis and Muhammad Ali, Roberto Clemente's baseball uniform and Phyllis Diller's wig? They may be crowd-pleasers, but shouldn't the kitchen be somehow better connected to food history here for the past 225 years? And while Hollywood and sports are legitimate subjects of study, how accurate is a cultural history that fails to mention the first American symphony orchestra (the New York Philharmonic), early American theater ("Contrast," by Royall Tyler, the first American play to be acted by professionals, appeared in 1787), or the development of folk music and the blues? Not every story can be told, but many of these exhibits tell no story at all. They are just spectacle, lacking context and intellectual content. The museum, authorized by President Eisenhower in 1955, opened in 1964 as the Museum of History and Technology and changed its name in 1980 to "better represent its basic mission -- the collection, care and study of objects that reflect the experience of the American people." Collecting had started much earlier, in the 19th century, under Smithsonian auspices. So its brass must play the hand it has been dealt; it can't change overnight. But the museum needs to narrow its mission, becoming less unruly in its collections -- some things, like the musical instruments, should go back to the mother ship -- and rooting its exhibitions more deeply in scholarship. And, yes, it can. There's evidence in a new exhibit called "Abraham Lincoln: An Extraordinary Life." Pegged to the 200th anniversary of his birth and lasting until 2010, it pulls together more than 60 objects from the museum's vast collection, starting with his iconic top hat (material and year, please? That's another failing throughout the museum -- very sketchy labels). Arranged chronologically, the show tells of Lincoln's rise from an impoverished nobody, hired out by his father to other farmers, to the presidency, through the Civil War, and along his poignant 1,700-mile funeral procession by rail. A section on John Wilkes Booth's co-conspirators tells an often forgotten chapter and adds depth. At the end, a series of photos of Lincoln's face, which ages incredibly in his final five years, tells a poignant tale, and leaves viewers pondering what his life was like during those intense, horrible days. That's the feeling one should have far more often elsewhere in the museum.